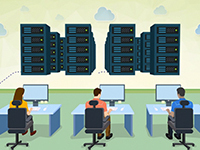 Use server virtualization and consolidation to transform your data center into a flexible cloud infrastructure with the performance and reliability to run the most demanding applications. 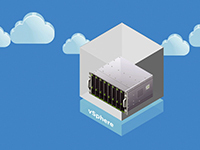 Begin your cloud journey with server virtualization. 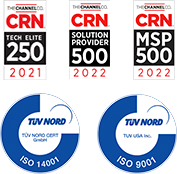 Then, at your own pace, evolve towards fully virtualized software-defined data center architecture: virtualize networking, storage and security to create virtual data centers. Simplify the provisioning of IT resources and applications, and make them available for consumption in minutes. Complete your private cloud by automating management for optimum performance, capacity utilization and compliance. Zones is your trusted provider of VMware software solutions. For more information or place an order, contact your Zones account manager or call 800.408.9663. Provide uncompromised control over all IT resources with the world's leading virtualization platform, which offers insight into IT capacity and performance. Consolidate servers, improve availability, enhance performance and optimize capacity with the world's leading virtualization platform. 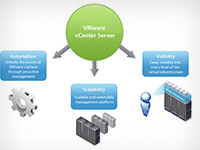 VMware vCenter Server provides a centralized platform for managing vSphere environments. VMware vRealize Orchestrator, included with VMware vCenter Server, automates tasks for VMware vSphere and enables orchestration between multiple solutions.